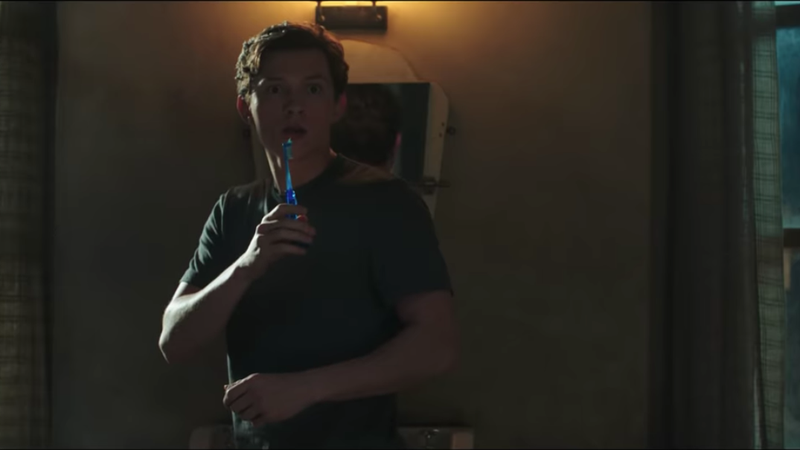 As one might expect, it didn’t take long for Marvel’s most devoted to dissect the Spider-Man: Far From Home trailer frame by frame. The Easter Eggs are abundant—Peter still uses Uncle Ben’s old luggage!—and so are the theories, with a number of fans asking whether or not the movie takes place before the events of Infinity War or after those of Endgame, when all of the heroes who dissolved into ash at the end of the former—including Spidey—will presumably return to our mortal coil. Unfortunately, a look at Peter’s passport offers no answers. But more evidence points to Peter’s trip taking place post-Endgame, if only for the marked absence of the kid’s mentor, Tony Stark. And, considering that the Endgame trailer begins with a parched, starving Tony floating through space, there’s a good chance the franchise’s Iron Man won’t live to see the MCU’s next era. The moment that’s really got Tony stans itching is Happy Hogan telling Peter that he’s “all alone.” Nick Fury, too, asks Peter if he’s “going to step up or not,” implying the need for a leader. Hell, that Fury is visiting Peter at all feels significant. Add to all of that Peter’s mournful glance at the suit Tony gifted him, as well as a check signed by Pepper Potts, and, well, it ain’t looking too good. Fans are already dusting off their mourning frocks, slowly acclimating themselves to the idea of an MCU without Robert Downey, Jr.
Of course, this could just be some calculated misdirection on Marvel’s part, but, if not, there’s always the chance that Tony could, as this theory suggests, live on in other ways. How the hell are we supposed to care about Ant-Man And The Wasp now?